MAD MAX: FURY ROAD (2015). Director: George Miller. Cinematographer: John Seale. Like most of you, I spend a part of each day on social media. I generally waste time, reading people’s humorous anecdotes or reading articles I’m directed towards. The whole process grinds to a screeching halt whenever I feel I cannot stomach the regurgitation of insipid memes in place of actual rhetoric any longer. I confess that it often takes longer for me to reach this point than it should. For the past week however, there has been a constant drumbeat amongst my Facebook friends and Twitter followers. MAD MAX: FURY ROAD. At first, it was the eager anticipation for a film fans have been waiting thirty years to see. Once it was released, the shouts grew louder as most of the people in my circle gushed about its quality, saying it was worth the wait. There has been so much enthusiastic screaming and cheering that frankly I’m a little sick of reading about it. I would like to just nod my head and let it all pass by without any further comment from myself. But I can’t do that. I have to add my voice to the chorus because the fans are right. MAD MAX: FURY ROAD is a transcendent piece of action cinema. My history with the MAD MAX series goes back about as far as I can remember. I still recall trying to get a TV station in with some rabbit ears while my family was staying at my grandfather’s cottage in upstate New York. In the middle of some sitcom I only half understood, a TV spot for THE ROAD WARRIOR came on. I may not have understood the appeal of that sitcom (and probably still wouldn’t), but I knew I had never seen anything like those thirty seconds before. Of course, I was prevented from seeing this film as it was rated R and for God’s sake, I was six years old. This would have been news to a lot of people since MAD MAX was barely released in the United States. In fact, when I speak of THE ROAD WARRIOR, that’s’ the film the rest of the world knows as MAD MAX 2. Since few Americans had an opportunity to see the original, that led to the title change in the States. It wasn’t even released with a rating, something I noted on the VHS box. I kind of thought that meant it was still forbidden in my house, but I convinced my dad that nowhere on this box does it state this was an R-rated film. He paid the rental fee plus the thirty dollar deposit (believe it or not, the most reasonable deal on VHS in the neighborhood) and brought it home. Not that it mattered as my mom made him go back up and get his money back since I was now forbidden from watching any television that night. Foiled again. I did finally get to rent THE ROAD WARRIOR and soon after saw MAD MAX with its terrible dubbing (corrected on the MGM DVD). MAD MAX: BEYOND THUNDERDOME soon followed and more than that, every single rip-off that came to our ever-multiplying video stores: WARRIORS OF THE WASTELAND, WARRIOR OF THE LOST WORLD, STRYKER, WARLORDS OF THE 21ST CENTURY and so many more. THE ROAD WARRIOR had opened the floodgates for a new post-apocalyptic subgenre. My mother called them “brown films” since every frame was full of sand and dust. And now comes MAD MAX: FURY ROAD, a film that I along with so many others have been waiting a full three decades to see. The wait was so long and the anticipation so intense that of course it would be completely understandable, even expected that it could not satisfy our jaded, adult hearts. And that’s why what George Miller pulls off is so extraordinary. We’ve become a far more cynical world and we’ve tasted disappointment so many times before. And yet, MAD MAX: FURY ROAD is one hundred percent satisfying. Even in the areas that don’t quite ring like the older films, it’s perfectly acceptable. I would call FURY ROAD a soft reboot. 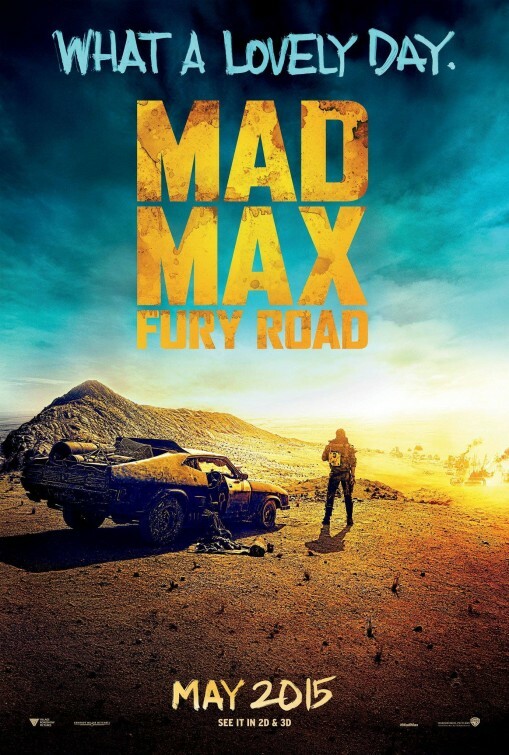 In other words, it references all three of the previous MAD MAX films in some way. But also, they have retconned some of what came before and even done some serious work to the Max character himself. Max is the lone road warrior, surviving in the wasteland behind the wheel of his Interceptor. A deleted scene from BEYOND THUNDERDOME reportedly had Max cradling a gecko and showing it mercy. FURY ROAD on the other hand starts out with his stomping on one and eating it. Max (now played by Tom Hardy) has also got quite a few bats in his belfry. After the tremendous loss he has faced, followed by years of living on loneliness and survival instinct, our road warrior has developed a serious case of Post-Traumatic Stress Disorder. He hears the voices of his wife and daughter. He sees their faces flash before his eyes constantly, as they are dragged under the wheels of a truck convoy. Purists of the series will note that Max never had a daughter but an infant son and the tragedy that befell his family was slightly different from the one depicted here. That’s not the only difference as Max himself is now different. He is not as cocky and outwardly intimidating as he used to be. He’s dangerous and definitely someone you wouldn’t want to tangle with. But he’s also twitchy, soft-spoken and someone who looks as if he’s barely holding it together. At the beginning of the film, Max is abducted and taken prisoner within Citadel, a fortress with massive water reserves. Citadel is run by Immortan Joe (Hugh Keays-Byrne, who also played Toecutter in the 1979 film), an old warlord, riddled with tumors who is looked upon as a god by all around him. His followers include a starving populace, his mutated offspring and an army of War Boys – terminally ill soldiers who believe a glorious afterlife awaits them should they serve their master well. Max finds himself in one of the most degrading positions possible. He is the “blood bag” of one of the War Boys, the enthusiastic Nux (Nicholas Hoult). His function stripped to literally as a blood supply for a terminally ill zealot. Immortan Joe also has a contingency plan to ensure future generations will continue his name. He has locked away several women and given them every luxury. There is not a trace of the dangerous wasteland on their bodies. They are fed well and cared for, but they are slaves. These are Joe’s breeders, women he has raped, impregnated and kept in a vault. It is one of Joe’s most trusted warriors, Imperator Furiosa (Charlize Theron) that betrays her master and absconds with the women, promising them a green paradise just beyond the horizon. Joe and his War Boys drive off in hot pursuit, with Max strapped to the front of Nux’s vehicle. Even Max’s own Interceptor is being driven by his abductors. Eventually, he gets free and reluctantly helps Furiosa and the women in their quest for a better existence. MAD MAX: FURY ROAD is a loud and chaotic film. One of the most disarming things about Miller’s newest is that after the pre-title sequence, it is basically three huge car chases with a little bit of breathing room in between. Ordinarily, this would be a recipe for mindless entertainment. There should not be adequate time to establish anything other than the set-up for the next major action sequence. But Miller has managed to expand on themes touched upon in earlier films and create a continually engrossing world. The hierarchy of Citadel is fascinating, as is the similar warlords in the area that control gasoline and ammunition, all three of them working in conjunction to create a stranglehold on the powerless. An element even more compelling than the world FURY ROAD depicts are the characters that live in it. More than once, Max does wind up being a bystander in his own film. I was unsure how I felt about this at first and I admit it took a second viewing to gain an appreciation of what Miller and Hardy were trying to accomplish. Max has been a take charge kind of anti-hero in the past. But this time, more often than not, he finds himself being outsmarted and outvoted by the people accompanying him on this journey. Hardy’s portrayal of the character, aided by the screenplay, seems to purposely take away the perception of invulnerability that may have built up over the years, despite the fact that Max ended each of the previous films as a battered mess. He’s not always sure of himself, his demons are catching up to him and he’s unsure if the visions he sees are helping him survive or driving him insane. Furiosa is an incredible character and Theron imbues it with the depth she has given some of her best roles. I had no problem seeing her become the focus for part of the film and if Miller decided he wanted to pursue that character further in whatever future projects lay down the line, I would not object. In the role of Nux, Hoult seems like a crazed disciple which is why it is so incredible to suddenly see him develop into one of the most human characters of the film. There are chinks in FURY ROAD’s armor, but you have to really look to see them. A line or two about the need for redemption seems a bit on the nose for instance. But the fact that one has to dig deep into the film to find anything truly objectionable also means these problems aren’t severe enough to warrant any demerits. MAD MAX: FURY ROAD is a reminder that story does not have to be sacrificed for the sake of action. All the same, this film gives us a better action spectacle than audiences have gotten for years, possibly decades. These extended action sequences are never dull, always offering a white-knuckle ride for the audience. The use of practical effects in these sequences makes it all the more incredible. We take it for granted that CGI is the way people do effects these days. I don’t have much against that, it’s a way to get things done and even FURY ROAD uses it in sparing amounts in order to enhance certain shots. But after dozens of Hollywood blockbusters, it’s easy to be fooled into thinking that CGI is the only way to do effects that are truly incredible. MAD MAX: FURY ROAD proves that the only thing we have sacrificed is our own imagination. The effects in this film are not the equal to what can be done on a computer; they eclipse those computer-based effects in every way. Miller’s film is a brilliant dissection not just of the lengths people will go to in order to survive, but also the lengths others will go to in order to secure their place of power. Immortan Joe has stripped the humanity away from hundreds of people, an essential means to retaining his godhood. Every person in Citadel has a function and they are defined solely by that function. War Boys are the cannon fodder, blood bags sustain the lives of those soldiers, Imperators do the necessary supply runs and yes the Breeders are there solely as chambers for even more future warlords. “That is my child,” he tells one of the women, “my property!” Dangerous and uncertain times can already do a lot to rob a person of their humanity. Max is living proof of that. Joe finishes the job and in fact runs a society based on that idea, with chilling, assembly line efficiency. George Miller has not given die-hard fans the film they wanted to see, he has given them something more. In terms of spectacle, thematic material and character development, he has given the entire world the action film they didn’t realize they needed so badly, the type of film that could serve as a benchmark, a lesson for films to follow and build upon in the future. And for that gift, I can only say thank you. The Best.